At this time of year, we take time to reflect on ourselves over the past year, and to set intentions for how we will be in the coming year. All of us have room for improvement (think about Carol Dweck's "growth mindset") to become our best selves. Our personal well-being — physical, mental and spiritual health — is key to unlocking the best of who we are, at the office, with our families and friends, with with ourselves. 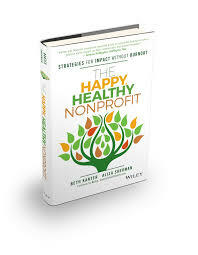 Beth Kanter's new book, The Happy Healthy Nonprofit, written with co-author Aliza Sherman, is a fantastic resource for leaders and managers in our community to reflect on both their own well-being and to consider how to foster healthier professional environments to help all of us thrive. Over the past few years at See3, we’ve been working hard on building a company culture that values the personal well being of our employees and invests in our team to be a productive family based on shared values. This attention is paying off, with happy and hard-working staff who are generous with each other and our clients. We take time to celebrate each other’s accomplishments in the office and outside of it. We are also attracting talented and diverse new employees who want to advance their careers and have a great quality of life while doing it. Because we’ve been thinking about these issues a lot, we are particularly excited about this new book, The Happy Healthy Nonprofit. In it, these two superstar authors tackle head-on an issue which those of us working in the nonprofit world know so well — burnout. If you want to find people who work really hard, in often challenging circumstances for low pay, look no further than your nearest nonprofit organization. Beth’s previous books looked at how nonprofits can change to be more nimble and function better in our newly connected digital world. I don’t think it’s a coincidence that the issue of employee health and burnout avoidance comes next. With the quickening of the pace of communications, more competition for donors' attention and more scrutiny of nonprofit work than ever, it’s no wonder that burnout is finally on the agenda. Self-sacrifice becomes a cultural norm in organizations and movements. Leaders who give up their personal lives for the cause often evaluate staff members’ value or commitment to the organization by how much they, too, deny themselves work-life separation and boundaries. That sounds really familiar! While this is true for so many of us in the sector, we couldn’t help but think about how this concept of self-sacrifice may unfortunately be particularly acute for women, who may have expectations of the need to work harder to attain leadership positions, not only in the nonprofit sector, but everywhere. One of the things we love about this book is how Beth and Aliza cite so many practical examples of organizations supporting employee and team health and well being. These real life stories provide inspiration for what you might address at your organization, and a template for your action, too. We’re honored (and proud!) that Beth and Aliza included See3’s HR and dog policy as an example of how organizations can change policies that impact quality-of-life for everyone working there. See3, a digital agency working with nonprofits, put several policies in place that promote well-being and that affect the way its staff works and manages work-life issues. The agency doesn’t count sick days or personal days, and it offers paid maternity and paternity leave policies, flexible schedule options, and work-from-home flexibility. See3 also has an office policy baked right into its employee handbook that allows employees to bring their dogs to work. While some of this attentiveness to culture and health has come from our company’s leadership, a lot of it has grown out of listening to our staff and empowering people to take the initiative to shape our company culture. Bridgett initiated the 10-minute yoga and by doing it in the common spaces and inviting others to join her, she has made a significant contribution to both the health of the participants and the culture of our company overall. Our vision boards hanging on the walls of our office integrate productivity, professional learning and health and wellness goals. By making all of these goals explicit, our staff is better able to support each other and celebrate our achievements. In The Happy Healthy Nonprofit, Beth and Aliza help readers understand what causes burnout and why self-care is critical for your nonprofit’s success. This book is a must read for nonprofit CEOs and managers, as well as anyone in this profession who wants to be happy and successful over the long term of their career. The self-care process they outline starts with basics — sleep, nutrition and exercise — but moves on to care that relate directly to job stress, such as mindfulness and gratitude. At See3, we have a tradition (based on research that suggested gratitude is a key ingredient to happiness) of including something we are grateful for in our staff-wide daily email check-in, such as support from a team member or spouse, for family health, or for a comical cat video. The Happy Healthy Nonprofit also includes powerful self-assessment tools to help you define your own challenges with self-care as a way to begin addressing them personally and across your organization. What we particularly love about this book is that it gives individuals the tools for their own self-care, without victimizing those who are feeling "less than optimally healthy”. We can’t solve this issue without changes to our organizations — and Beth and Aliza don’t let the organization off the hook. Organizational structures and policies have perhaps the greatest impact on employees’ ability to work with less stress and avoid burnout. The book gives very clear examples and guidance for organizations looking to promote a healthy culture. Thanks to Beth for sharing an advance copy with us. For months we’ve been excited for this book’s release, and it meets all of our very high expectations. Order a copy for yourself, and while you’re at it, consider ordering an extra to give as a gift to your leadership or coworkers as well. While health may start with yourself, a happy, healthy nonprofit is good for everyone. The Happy Healthy Nonprofit is available everywhere books are sold. You can buy it here on Amazon. About the authors: Lisa Colton is the Founder and President of Darim Online, and the Chief Learning Officer at See3 Communications. Michael Hoffman is the CEO of See3 Communications.